From the moment you walk into John-Michael´s, their attention to detail is evident. From the bright smiles to the white gloves, the staff of John-Michael´s are indeed a team devoted to customer service. The elegant neutral décor, with windows enhanced with rich tapestries is very inviting and warm, with an "unobstructed" view from all guest tables to head table and dance floor. 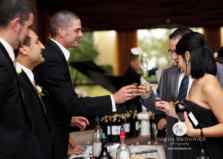 We also offer full catering services at Eagle Valley Golf Course Banquet Hall. The kitchen crew at John-Michael´s consists of a perfectly structured European Team. We have well over 400 years of experience in our kitchen, and it is evident with the quality of food that we present to our guests. The Premium Bar at John-Michaels´s is by far Niagara´s most extensive selection. From the espresso & cappuccino to the cognac & grappa, your thirst will be quenched with your favourite spirits and beverages. Whether you are planning a corporate event, an intimate function with 125 guests or an elaborate Wedding of 400 guests, you can be assured that your special event will be "picture perfect". For that "personal and elegant touch", call Lino or Vincent to arrange a consultation to discuss your needs. John-Michael´s Banquet & Conference Centre will continue to be a dominant force within the hospitality industry for many years to come.